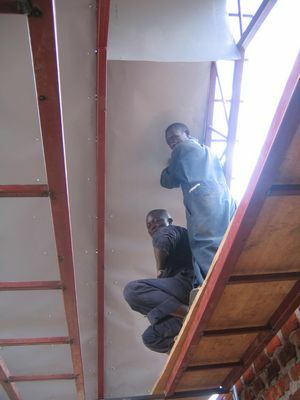 Today, we are finishing the kitchen wall as the roof is now on. After this we will continue with the plastering of the kitchen and placing the furnace. Today, we have laid the top ridges on the roof of our first dormitory block,and what a beautiful sight it is, right from the road you can now see that something serious is happening here in Osia. Thank you our donors who make us able to continue doing this work. And not to forget the 100 cubic meter of rock that has been chiseled out of the rock to make place for the septic tanks and the soak-pits. All this amounts to the complete sewage system that we buried in the ground in Osia. You won’t see it tomorrow, but you surely will use it after you use the bathroom.The distance from the top of the land to the bottom of it is 300 Meters. 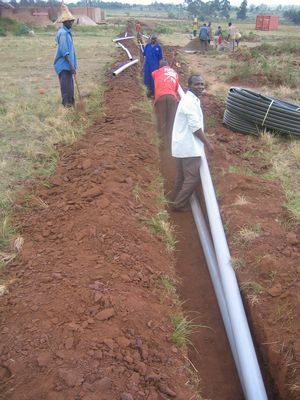 We have had to bury one sewage pipe, one waste water pipe, one fresh water pipe and one pipe for cables.It is an investment that is a bit hard in the beginning but it will make it easy to add another building later on.We have buried these pipes with a layer of cement to protect them. 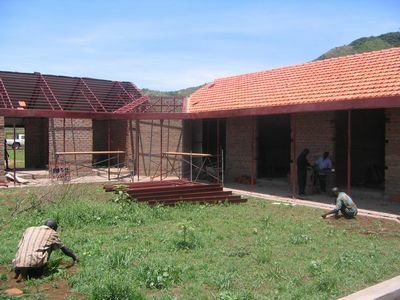 When the boys are finished with this, we will be able to hurry on with the roof-tiles which we have already bought. As our 25 acre land in Osia is a very empty and totally void of trees we decided it was time to do something about this. The problem on our land is that it only has 30cm of soil, underneath that we have solid volcanic rock! And so trees can not really get started until you give them some help. So we started digging holes in this rock of nine cubic meters. 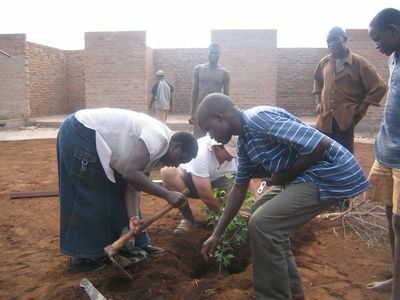 We filled it with good top-soil and planted trees right in the middle of it. We dug 100 holes like that and have now plated all the trees. 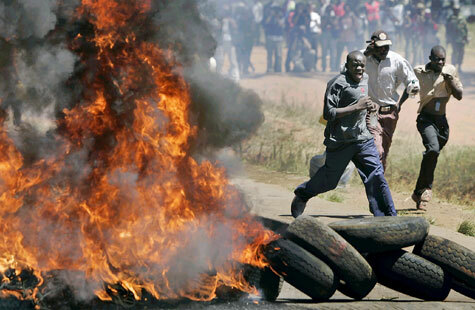 Due to the political chaos in Kenya, Uganda faced an acute fuel shortage. This completely crippled our activities during the month of January. When our neighbor Kenya sneezes, we catch pneumonia! It’s THAT bad!